With the jammed packed crowd at Yankee Stadium chanting “Derek Jeter”, Derek sends a 3 and 2 slider into the left field seats for hit #3000. Talk about a flair for the dramatic. To put it into perspective, some 16000+ players have played in the MLB. Derek is only the 28th player to hit that lofty milestone. No matter how you cut it…that is pretty damn impressive. I could go on and on about Jeter, but I do have some beer tasting to do. 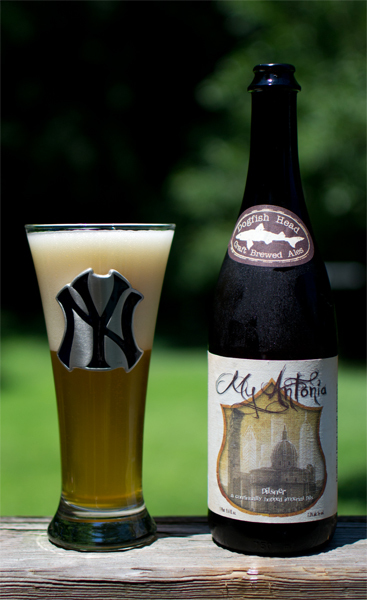 The first thing I thought of when I saw beer #223, My Antonia by Dogfish Head, was My Sharona. Don’t know why that came to my mind but it did. This is an American Double Pilsner or an Imperial Pilsner which is a new category for me…yeah baby! The ABV for this beer from Milton, Delaware is sitting pretty at 7.5%. It poured a hazy pale yellow or gold and had the most lovely frothy white head that left quite possibly the best lacing of any beer I have had so far. Lacing for the uninitiated is the when the head of a beer clings to the glass. It can leave some really neat random patterns as it clings. The nose was full of bread, grains, and lemon with a nice earthy aroma. The hops really took over in the taste with a grass like flavor up front then it gets malty with those bready flavors. It finished slightly bitter with a lemony flavor. The mouthefeel was heavier than I expected and very smooth, almost creamy with a moderate amount of carbonation. Weird thing about this beer was at times it was smooth and creamy and another sip would find it quite crisp…odd. With the alcohol hidden nicely, this was nice and drinkable for myself. I kind of liked this even know I’m not a big Pilsner fan. It may be my favorite Pilsner style beer I have had so far. Once again…I raise a glass to the greatest shortstop, and future Hall Of Famer, to ever don the Yankee pinstripes. Let the chanting begin… “Derek Jeter” “Derek Jeter”….